8. Movt. 3 BORN IN BROOKLYN 5:48? Any musician worth his or her salt knows that timing is integral to making music. From counting notes in a measure, to orchestrating in different meters, the element of time is foundational to every piece of music. For most artists, being sure that a song has proper timing is mostly a musical decision. 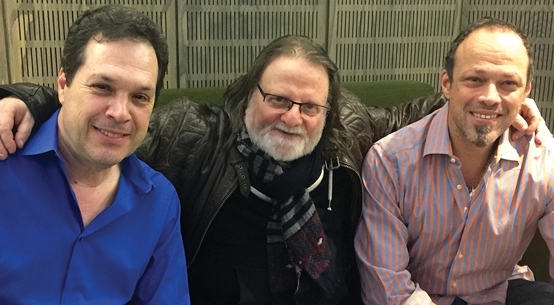 But in the case of Crossing Borders, maestros Richie Beirach, piano, Gregor Huebner, violin, and Rich De Rosa (conductor) have thought about timing in a broader sense. Their spectacular and sparkling album with Germany’s WDR Big Band is both timely and timeless. In the US and Western Europe, the rise of tribal politics and a trenchant xenophobia has taken hold. Building the US-Mexico border wall has become a political issue, not just dividing countries, but Americans who support or disagree with this measure. The resulting heightened concern and anxiety towards people who are different continues to shape the national political dialogue. This is a conversation in which artists can and should participate. Musical creators learn from an early age that they should evaluate people on their intrinsic talents and skills. And that music ultimately has a welcoming spirit, in which artists and audience members can be in communion with each other during and throughout a performance or production. Crossing Borders is a production with this sort of welcoming spirit. It blends borders between classical and jazz, traditional and edgy. 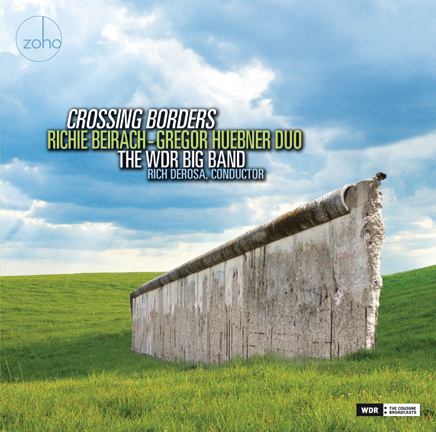 Both Richie Beirach and Gregor Huebner were classically trained and play instruments that are often used to perform music by Bach, Beethoven, and Brahms. “I wanted to do something unusual,” said Huebner. So, when he was commissioned by the WDR, he jumped at the opportunity to create something of the moment, and very much needed. The first piece Rectilinear/Paradox is a medley of two Beirach compositions. It’s a rather short number but makes a profound statement. It’s the opening salvo of what’s to come, an album that knows no borders or limits. The juxtaposition of these two pieces showcases how different sounding elements may mesh together. The more melodic “Paradox” with its song-like form, paired with the contrapuntal material of “Rectilinear” makes for tantalizing beginning. The centerpieces of this production are two concertos for solo instruments and jazz orchestra composed by Huebner. Given that solo concertos are usually within the classical music genre, and performed with an orchestra, this album’s title “Crossing Borders” thus derives its second meaning by describing these two concertos’ musical category-transcending character into big band jazz. “To write for a big band in this way is something new and fresh,” he says. Violin Concerto No. 3 is comprised of three movements. The first is Kathmandu and it is based on the devastating earthquake which occurred in Nepal in April 2015, around the time that Huebner began thinking about this project. It begins with a slow introduction followed by a scream or outburst with a heavy rhythmic structure. As the second movement The Grave begins, a more serene aesthetic envelopes the listener, as the number is based on one note that varies in terms of volume and density, as performed by Huebner. This represents the settling down or aftermath of the earthquake. Finally, the third movement is entitled Two Thousand 15 and presents a more uplifting and positive outlook on the future, the rising from the ashes. Snow Leopard is a masterful arrangement, inspired by the original 1978 ECM LP “Eon” of the Richie Beirach Trio with George Mraz and Jack DeJohnette, which have moments of silence and space. It’s in this “emptiness” that DeJohnette responds gracefully. “That’s where I got the idea,” says DeRosa, “to transcribe Richie’s improvisation from the 1978 recording, and then ask him to respond to his solos from years ago.” The WDR horn players followed suit by performing Richie’s transcribed piano improvisation. That a classic recording could be recast in this way is a commentary on how sometimes the best ideas come from looking at from where we’ve come. Huebner composed the Piano Concerto No. 3 for his friend Beirach, who he has collaborated with for some twenty-three years. It is entitled “The Code” since that’s Beirach’s nickname as he knows “the code” of playing music at a high level. Indeed, this concerto also has three movements, beginning with Into the Quest. Beirach and Liebman had a band “Quest” which began in the 1980s and this piece evokes the energy from this band. There is a terrific solo transition into the second movement It’s Enough. It is based on a 17th century German Lutheran hymn which has a deep history in German classical music: Bach arranged it as a chorale in his Church Cantata BWV 60, and Austrian composer Alban Berg employed it to great effect in his Violin Concerto of 1935. “This is Richie’s forte, to take another composition and make it his own,” said Huebner. The last movement Born in Brooklyn is a coming home of sorts. Beirach was born in this borough and grew up in this environment rich with creative energy. Rich DeRosa, Richie Beirach, Gregor Huebner. Elm was written by Beirach on Christmas Day 1979 when he found out that his peer, Polish jazz violinist Zbigniew “Zbiggy” Seifert, a violinist of great import, had passed away. “This piece became my best-known composition,” says Beirach. The direct emotional appeal of the melody and simplicity of the harmony and structure certainly strikes a chord within the heart. It opens with a chorale set in dark brass followed by a moment of solitude, in which there’s a written cadenza for bassist John Goldsby. The duet between violin and guitar evokes a somber, solemn moment, as Beirach performs a stirring solo. Pendulum, another Beirach composition from the 1978 ECM “Eon” LP, may sound like a simple and short piece. This modal number is anything but. It incorporates a chromatic pedal-point that builds intensity, over which the melody unfolds. The piece culminates with a stomping groove that grows in volume and instrumentation. It’s certainly a dazzling number, showcasing both brilliant arrangement and performance. It has been a privilege and high honor to produce this production with and for these musical giants. Creating music that speaks to the time in which we live is a charge that I hope more artists will be inspired to take on. Award ?winning producer. He is a New York Times bestselling author. Produced by: Kabir Sehgal, Paul Avgerinos, Gregor Huebner, and Rich DeRosa. Associate Producers: Lucas Schmid, Friederike Darius. Art direction, composite photography and package design by: Jack Frisch. Executive Producer: Joachim “Jochen” Becker. Gregor Huebner Music, Mindvine Publishing (2-4, 6  8). Richie Beirach’s compositions are arranged by Rich DeRosa. Licensed by WDR mediagroup GmbH. who did a magnificent job mastering some difficult music in such a short time!